Photo: Roberta Hill, Maine Volunteer Lake Monitoring Program. Drawing: University of Florida/IFAS Center for Aquatic and Invasive Plants. 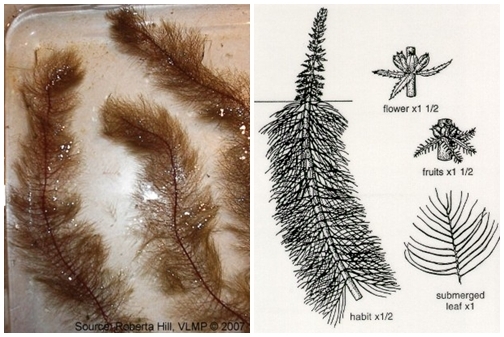 Variable watermilfoil is a submerged aquatic plant that has densely packed whorled leaves. It is usually found along the shorelines of lakes and ponds. Watermilfoil can grow in depths of up to 10-12 feet, forming dense mats near the surface of the water. The plant produces a spike-like flower that grows above the waters surface from mid to late summer. This species of watermilfoil is known to exist in Massachusetts, Vermont, New Hampshire and Connecticut. It has been identified in a few Maine lakes. Variable watermilfoil grows very rapidly. It reproduces primarily by fragmentation. The plant can break apart very easily due to wave action produced by boats, swimmers or other animals. The introduction of one single fragment of this plant can result in the infestation of an entire lake. Once introduced into a lake, variable watermilfoil is virtually impossible to eradicate. The impacts of an infestation have the potential to be devastating. Dense mats of variable watermilfoil impair boating, fishing and swimming. Reduced lake water quality is another concern along with the potential decline of shorefront property values.